Even seen an integrally suppressed rifle? 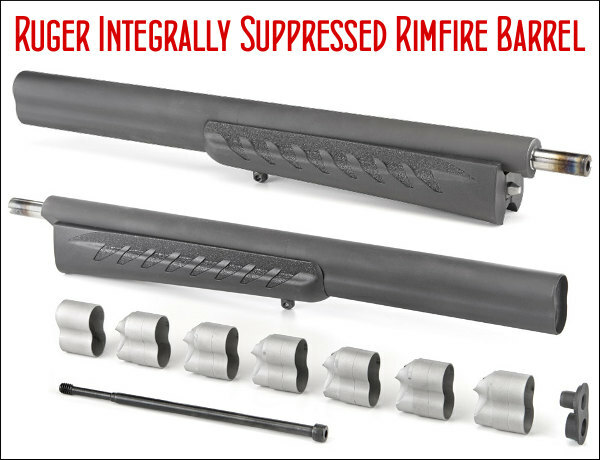 Ruger offers this technology with its new Silent-SR ISB, a multi-baffle integrally suppressed barrel (ISB) for Ruger 10/22 takedown models. This system reduces sound levels to an average of 113.2 dB with standard velocity ammunition. That’s very impressive — consider that an unsuppressed .22 LR firearm can produce noise levels as high as 140 dB with standard velocity ammunition. That’s well above the threshold where irreversible hearing damage begins. (Source: NC Silencers). Even if you are not interested in a suppressed rimfire rifle (or live in a state where suppressors are forbidden) we think you’ll be interested in Ruger’s technology. The Silent-SR employs a long, multi-element “baffle stack” that can be easily removed for cleaning. Watch Integrally Suppressed Barrel in Action. CLICK HERE to View Video on Ruger Site. Scroll to bottom of Ruger page after jump! The Silent-SR ISB quickly and easily assembles to any Ruger 10/22 Takedown or 22 Charger Takedown, and features an induction-hardened breech with cold hammer-forged barrel that provide easy takedown and accurate return-to-zero. Reducing sound pressure levels of .22 LR to an average of 113.2 dB with standard velocity ammunition, a 10/22 Takedown rifle equipped with the Silent-SR ISB is as quiet as a bolt-action rifle with a thread-on silencer. The relatively long barrel of the Silent-SR ISB (compared to other integral suppressors) means the bullet generates energy near that of a 16″ gun for consistent, accurate and effective performance on target. The pushed-cone baffle geometry has been stretched to utilize the volume under the barrel maximizing suppression of the gunshot without disturbing the travel of the bullet. 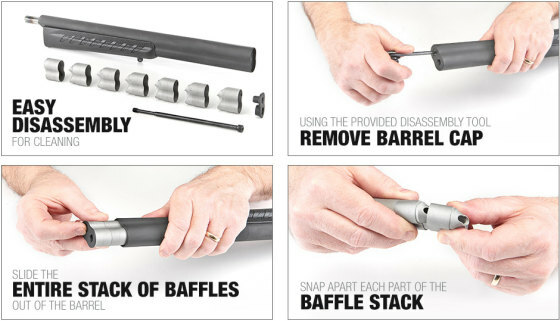 Disassembly for cleaning is as simple as separating the barrel from your firearm and loosening the Silent-SR ISB’s single assembly screw using the included 5/32″ hex key tool. Once loose, pull the screw to remove all six 17-4 stainless steel baffles, spacer and front cap free of the sleeve for cleaning. The sealed baffles keep the fouling away from the serialized sleeve, yet easily come apart even after thousands of rounds. Finished with Cerakote, the Silent-SR ISB is engineered and built for a lifetime of hard use without clogged ports, seized components or loss of suppression that often plague other integrally suppressed rimfire barrels. 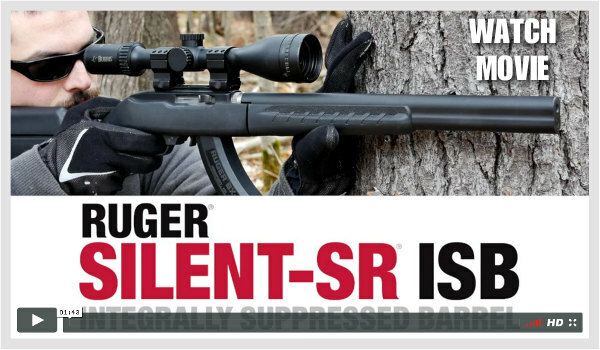 Share the post "Ruger Offers Integrally Suppressed Barrel for 10/22 Rifles"
Steyr Arms has introduced a new straight-pull rimfire rifle that should work well for rimfire practical/tactical games, cross-training, and varmint hunting. Available in three chamberings, .22 LR, .22 WMR, and .17 HMR, the new Steyr Scout RFR emulates the look of a Scout Rifle, but in a rimfire platform. This rifle, which first appeared in 2016 in Europe, made its American debut at the NRA Annual Meetings in Atlanta this week. Frankly, we don’t need or want the extended forward-mounted rail, because we would use a conventional higher-magnification optic, rather than a long-eye-relief scout scope. But we are excited about the straight-pull action, 10-round magazine, and nicely-designed stock that should be good for tactical comps. For mounting conventional scopes, an integrated 3/8-inch dovetail base runs the full length of the receiver’s topside, and the RPR comes with Weaver bases mounted on the top of the receiver. MSRP is $599.00. 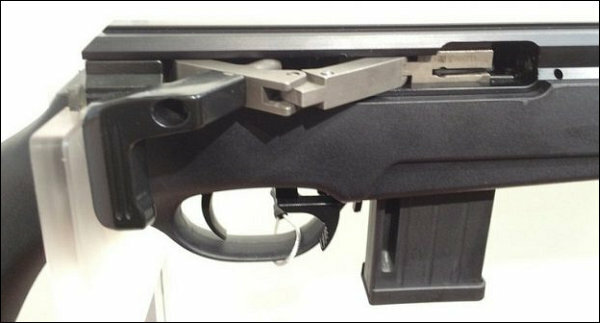 Detail showing ISSC Biathlon-style SPA straight-pull action with trigger-guard safety. Based on the proven, biathlon-inspired SPA action built by Austrian gun-maker ISSC, the Steyr Scout RFR was designed as an economical, minimal-recoil trainer. 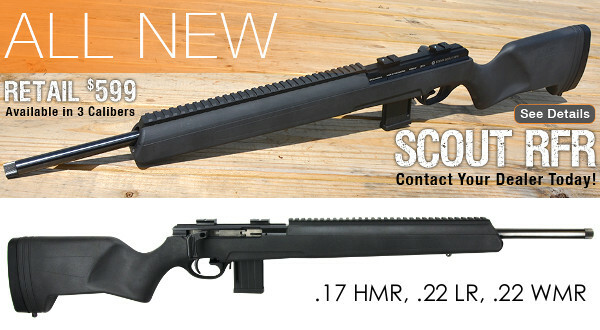 Available in .22 LR, .22 WMR, and .17 HMR, the Scout RFR has a smooth, straight-pull action allowing for fast cycling with the provided 10-round magazine. Check out the video below to see how the action works. Trigger pull weight is 3 lbs, 4 oz., about right for tactical games. We might want a slightly lighter trigger for varmint work with the .17 HMR version. In fact, we think this might make a great “squirrel gun” in .17 HMR. The Scout RFR’s Eloxal-coated aluminum receiver secures a 20″ heavy-contour barrel. Both the .17 HMR and .22 LR barrels are 1/2-20 UNF threaded for attachments, while the .22 WMR barrel is unthreaded. The Scout RFR measures 35.6 inches long, and it weighs 7.3 pounds without optics. An optional knife stows in the stock, and standard Steyr SBS/Scout buttplate spacers can used to adjust length-of-pull. Included accessories: Owner’s manual, two Weaver adapters, and one 10-round magazine. Share the post "New Steyr Scout RFR Rimfire Rifle with Straight-Pull Action"